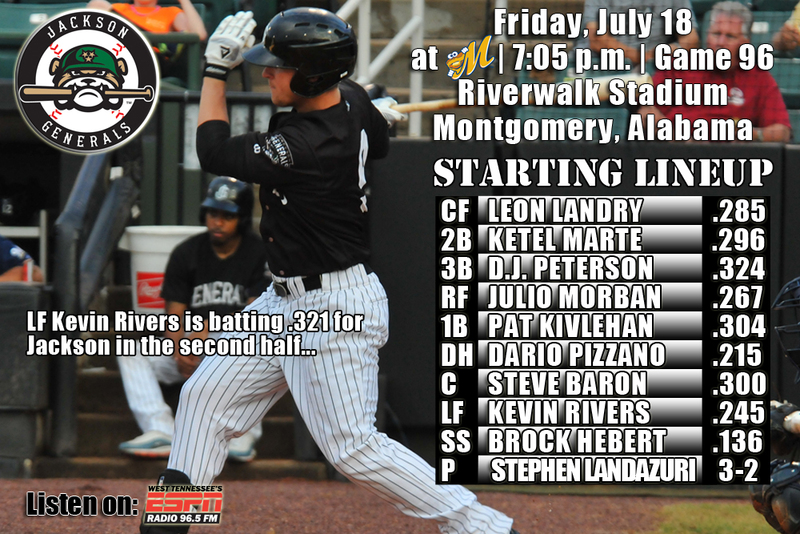 • The Generals play game 3 of a 5-game series in Montgomery (1-1) tonight at Riverwalk Stadium…Jackson is coming off back-to-back series victories at HVL (3-2) and vs. BIR (3-1)…have won 7 of 10 overall…will play 13 games with Montgomery over the course of the final 44 games, 8 coming at Riverwalk Stadium. Patrick Kivlehan RBI triple, Julio Morban RBI single and a Dario Pizzano three-run home run. • Every player in the lineup recorded a hit including six multi-hit games. D.J. Peterson recorded three singles, while Kivlehan had a double and a triple. • Tyler Olson recorded the win while Matt Brazis (1.0), Moises Hernandez (1.0) and Richard Vargas (2.0) shut down Montgomery over the last 4.0 innings. • OF Dario Pizzano reached base 4 times Thursday and is currently has an 9-game hitting streak and is batting ,526 (10×19) with 6 runs, 3 triples, 2 home runs and 8 RBI over his last 6 games. His average has jumped from .163 to .215 during hit streak. • July by the numbers – After batting .294 as a team in June, the Generals are currently batting .289 in July, which ranks 1st in the league. The 14 July home runs ranks 3rd in the league and 8 wins is T-3rd. • Montgomery leads the league with 22 home runs during the month of July. They are batting just .235 as a team this month, but are 8-7 as a team. runs, 9 RBI and 2 walks. • OF Leon Landry has hit safely in 16 of his last 17 games, batting .316 (24×76) with 9 runs scored, 3 doubles, 1 triple, 4 RBI and 7 stolen bases. Since June 7, Landry has hit safely in 28 of his last 31 games with 15 multi-hit efforts, batting .349 (44×126) with 19 runs scored, 6 doubles, 3 triples, 7 RBI, 3 walks and 13 stolen bases. During this 30 game stretch he has raised his season average from .236 to .285. • 3B D.J. Peterson has hit safely in 16 of 17 games with Jackson, batting .324 (23×71) with 9 runs scored, 4 doubles, 4 home runs, 8 RBI and 4 walks. • Monday RHP Victor Sanchez was named Southern League Pitcher of the Week, July 7-13. Sanchez recorded the win in his only start during the week on July 12 vs. Birmingham. He allowed only 1 run on 3 hits, while walking 1 and striking out a season-high 9 batters in 8.0 innings. ERA (3 ER, 19.0 IP). During this stretch he has limited opponents to a .156 (10×64), while walking 5 and striking out 15. • D.J. Peterson was selected to play in the SiriusXM All-Star Futures Game on Sunday at Target Field. Peterson started at first base for the U.S. Team and was 1-for-2 with a double. Peterson’s former High Desert teammate Gabby Guerrero, the starting DH for the World Team, was 0-for-2 with a strikeout. • RH Richard Vargas has appeared in 9 games since the All-Star break going 1-0, and is 3-for-3 in save opportunities, not allowing a run in 10.0 IP. Vargas has walked 5 and struck out 12, while giving up just 2 hits holding opponents to a .057 AVG (2×35). This is after going 0-1, with a 6.12 ERA in the first half going 2-for-4 in save opportunities walking 24 and striking out 30 in 32.1 IP.